Last night Anderson was weaned off his ventilator and put on a PCAC (aka a CPAP), but he was working too hard so they had to put him back on the ventilator. I have to say, I don’t mind – I don’t want him working too hard to breathe when he has to work so hard to grow, and the PCAC covered his whole face so we couldn’t see his little ears and downy blond hair. He loves to cross his legs. We saw that on an ultrasound too. He’s a pretty chill little baby but also a squirmy worm. Perhaps that’s also because he’s being given caffeine for his apnea! He likely has a PDA but they will confirm tonight with an echocardiogram. The first treatment is indomethacin which I also got to stop contractions. Boy also is getting a PICC line. Like mother, like son! The meds can cause kidney issues, so they will keep a careful eye on his urine output to make sure he’s tolerating it before giving him more. We hope it works, however, because if two rounds do not, then the next step is a cardiologist. We have to get the heart loop closed so that he can get enough oxygen to the blood flowing through the rest of his body, so that his organs can function as they’re supposed to. Everything sounds so scary, yet in a lot of ways he’s a “textbook” preemie, afflicted with all the common ailments of a boy his age – so as the doctors say, nothing they haven’t seen before (and let’s hope it stays that way!). He sleeps so peacefully, with his hands under his chin or on his cheeks. Today D told us the first round of indomethacin didn’t close the PDA, so he starts another round tonight. Fingers crossed. He’s also anemic from all the blood draws, so after tonight’s CBC they may have to give him a blood transfusion. Again, like mother like son. I pumped by his bed for the first time. First time I got emotional at his bedside. Maybe it’s the baby blues finally come in! In any case, I’m not worried about its normalcy. I have a son in the NICU, so I feel I’m perfectly justified in having some weepy moments in my days. It’s funny to me that I’ve gotten pretty blasé about medical procedures. Oh, he needs a blood transfusion? No worries. Of course he does. He’s getting a lot of blood drawn and he’s a little guy. Today is a bad day. He needs the PDA ligation and he’s had a setback on the vent. It’s a powerful reminder of how fragile he is and how far we are from being out of the woods. I can’t stop crying. We are through the first week “honeymoon period” in the NICU, and now he’s regressed a few days, which is just scary even though the doctors are pretty confident. He’ll have the minor heart surgery (I know, thinking of that as minor is crazy) this week that we hope will help with some of his other issues in moving oxygen and breathing better – we were able to do one day of kangaroo care before they had to move him to a more intense ventilator that doesn’t allow us to take him out, which is hard – once you get to hold him, it’s hard to be told we now have to wait a week or two to hold him again! And poor K didn’t even get a chance yet. I think this is “weepy week” as the baby blues hit and his fragility becomes more apparent. Week one he was doing “surprisingly, shockingly well” according to the doctors, and now he’s doing just okay and some of the signs are “worrisome.” We were told the NICU would be a rollercoaster but it was hard not to be optimistic after the first week! I, on the other hand, am feeling much better every day. The healing from the c-section is going well. It’s nice not to have to worry about excessive bleeding every night anymore. It’s hard to remember I just had a baby last week and I’ve only been home from the hospital for a few days! Anderson is having his PDA ligation surgery as I type this, and I’m calmer than expected because the waiting is over, at least. It was supposed to start at 8:30 a.m. but he wasn’t stable enough (CO2 was high) and they needed to wait – since only one of his little lungs has to do double work during the procedure, he needed to be super stable before the surgeons felt comfortable proceeding. B (his nurse) stopped in to say that the prep went well and everything looked good to begin, so now we’re just waiting again – but this time, more optimistically, as the hope is that (after a few rough recovery days) this will help him breathe better so he can be moved off the jet ventilator and we can hold him again. Yesterday was rough for Ander. We had been warned that it would be, post-surgery, but it’s still hard to hear the doctors say that they’ve done basically all that they can and now it’s up to him. He was a bit of a mystery – his blood gases were good, his heart rate and blood pressure were good, but his oxygen saturation kept rapidly dropping to the 40s or 50s (it’s supposed to remain between 87% and 95% at his age). What that indicated was that his lungs were not efficiently exchanging gases. The only thing the doctors can really do is increase the oxygenation he’s receiving on his vent. When he was born, he was breathing room air – approximately 20% oxygen. His levels of oxygen needs were gradually increasing over the last two weeks; before the surgery he was up to 68% oxygen. But yesterday, he was at 100%, and still having issues. The doctors could only then give him some medicines to help his heart work more efficiently and hope that that helped, though the side effect would that it would raise his blood pressure and heart rate, which is also dangerous and could worsen his (currently very small) IVH (brain bleed). We called after leaving last night, however, and it seems he was more stable, which we noticed even when we were there, when Dr. S came in and saw that his saturation was up to 82% and did a little dance (we like her. She’s also a hugger). We both liked that when we touched him and sang him Christmas carols, his stats would raise even to the mid-90s. Hey, they were the only songs he heard in utero, as he developed his hearing in December and that’s all I listened to! Plus he was very active in church when there was Christmas singing going on! We’re hoping that today he’s a little more stable, and that recovery continues from here. I don’t think I really realized just what the NICU rollercoaster looked like until the last few days. Ander is still recovering from his surgery and he’s still not out of the woods, though the doctors were hoping he’d be weaned from the ventilator settings by now. He was getting better very slowly on Sunday and Monday, but today he’s plateaued again, which is frustrating, especially as the doctors aren’t sure why. The nurses are very positive about his recovery, but the doctors don’t hesitate to tell us that he’s “critically ill” and that “they’re doing as much as they can; the rest he has to do on his own.” We know he’s a fighter because he was so active even when sick, when other babies are often limp, so we’re hoping he can pull through this one. It’s a wild ride, the NICU… last night Anderson was doing very poorly, and we both left the NICU crying after we were given the “If he survives” speech by one of the neonatologists (not the best bedside manner, that one). We didn’t sleep very well last night, wondering if we were going to get that dreaded midnight phone call; K rearranged her work schedule so we could spend most of today at the NICU, not knowing what the day would bring for him. We recognized that if he kept trending downward from where he was, there wouldn’t be much time. Thank God, he had his favorite nurse last night, and this morning, he was doing much better. Not perfect, but MUCH better. For the first time since he was born, we sat for hours at his bedside without a monitor going off. His oxygen was down to 90% and his other vent settings were also lower, and his saturation was consistently in the 80s. We read him a few books, but then just sat by his bedside. We left today feeling much more encouraged about his prospects – we just hope it stays that way, knowing how we now know that things could change or turn at any moment. Other things I am grateful for: health insurance. Boy, am I grateful for good health insurance. I choose a pretty pricey plan for this year as I anticipated being in the hospital for several months, but it sure is coming in handy now. Plus, UnitedHealthcare is great in other ways. I was assigned a neonatal nurse who calls me every week to find out how we’re doing and to see if we have any questions. We got a care package with a diaper, a onesie, a bib, and a Dr. Spock book tucked in a diaper bag. But mostly, I love that my bills are all under $100. Aaah, thank you insurance. So how am I doing? Okay, considering. Before I was discharged from Rush I was given a depression screening. I had to laugh at the question “Do you feel unusually anxious for no good reason?” “I think I have a good reason,” I told the nurse. And fortunately, except for what I feel is perfectly rational concern and sadness, I mostly feel okay, emotionally. It helps that I have such a wonderful, loving, supportive, strong wife. She’s definitely the strong one! Of course, waking up 2-3 times a night to pump isn’t super fun when the bedroom is cold and there isn’t a cute baby to cuddle, but at least I know my milk is still going to my baby, and I’ve got a good system worked out now. I no longer have to breathe into this breathing apparatus thingie that helps prevent post-surgery pneumonia. I had my 2-week checkup and was given the all clear to start driving (short distances, with someone else in the car) and mild exercising (walking on a treadmill, not outside in the snow and ice; light weight arm exercises). And surprisingly to me, today I put on my regular jeans. No more maternity clothes! I guess I shouldn’t be surprised as I was only 5 months pregnant and had only been wearing maternity clothes for about a month (I didn’t even get to wear many of those I had been loaned!). But it was still a surprise! Today we found Ander’s room buzzing with staff when we arrived. At first I was nervous that maybe he had deteriorated from yesterday. But then we realized that his jet vent had been turned off! Ander is now back on his conventional ventilation machine and gets to breath as frequently and as deeply as he wants (instead of having small puffs of air constantly keeping his lungs inflated). He’s come down on lots of vent settings, but still has room for improvement. Overall our visit was great today – he was alert and wiggling around a lot. We hadn’t really seen his legs in several days (because he has been so well covered and swaddled). But he’s been busy growing under all of those covers and he officially hit 900 grams (almost 2lbs!) and is looking great! The focus for the next few days will be to help him expel all of the mucus in his lungs left over from his infection. His nurses have been suctioning him a lot (which he doesn’t like and wrinkles up his nose while they do it) and he’s breathing and saturating much much better. Tonight we will try to regain a sense of normality by going out to a movie with friends. Saturday took us for another ride on the NICU coaster. Ander is now back on the jet ventilator (but on lower settings than last week). He basically has the worst chest cold known to man – you can see all of the mucus on his xrays and it’s causing his lungs to stick together and close up. At his lowest point on Saturday there were doctors and nurses and respiratory therapists crowding around him suctioning and hand bagging his airway trying their hardest to keep his saturation levels out of the toilet. A mother should not have to see her baby turn from pink to blue, but he pinked back up again relatively quickly. As it’s been explained to us, he can either ventilate (expand his lungs) or oxygenate (get oxygen into his blood stream) but he can’t seem to do both at the same time. Thankfully this is something they have encountered before and they seem fairly confident about getting him through it. We left the hospital late on Saturday once he was stable and resting comfortably again. We were cheered to find him that way again on Sunday morning. In fact he was so calm and stable that we found our selves just staring at him and enjoying him for the first time since before the PDA surgery. We’re both more confident when handling him (changing diapers, etc.) and he seems much more robust and less fragile despite the whole not breathing thing. All in all though, this ride is exhausting so when he is sleeping and quiet, we’re trying to let him be. K’s been learning how to knit and I’m napping whenever the alarms aren’t going off. So now it’s Monday and this morning the radio informed us that it was as warm as it would be for the next three days (it is currently 1 degree F). We’ll get over to visit this afternoon, but first some fine work men are here to rip out the drywall in our living room ceiling and pull up our floor. This is the demolition to take care of the giant leak that we had after Polar Vortex 1. There were four inches of standing water on the roof of our building and a significant amount of it came through the light fixtures in our front room. But with a little dude who will likely have respiratory issues for several years, we’re not taking chances with mold! They’re supposedly going to put up some temporary insulation, but we may be crashing at the Marriott across the street from the hospital if it’s intolerable. And we’re back in the trenches with our little buddy. Monday afternoon’s visit started with another flurry of activity around a tiny baby who wasn’t getting enough oxygen. The doctors were playing a “game” of ventilator roulette trying to find the best combination of pressure, suction, ventilation, and oxygenation. However, a new threat had entered the picture: pneumothorax. Because Ander was being over ventilated to try to increase his oxygen supply, the air that was being pushed into his lungs wasn’t having a chance to escape. Basically he wasn’t able to exhale. So his lungs were hyperinflated and on the brink of bursting. When they switched ventilators he was underinflated and not getting enough oxygen. So back to the other ventilator, etc, etc. Our planned 1 hour visit quickly turned into an anxious multi-hour waiting game, watching his monitors, watching his tiny chest jiggling under the tiny puffs of oxygen, and praying. Lots of silent and not so silent praying. At 5pm the doctors turned over. Our primary doc, the director of the neonatology division, an incredibly positive but aggressive doctor, was replaced with another doctor we’ve had before, the hugger. She is less aggressive treatment wise, but very frank and realistic about what’s in the best interest for our baby. She talked with us about the road ahead and started putting some of these aggressive treatment options in frames of quality of life and expected outcomes. To say it was eye opening would be an understatement for sure. So here’s where things stand now: Ander has chronic lung disease. He’s had it since birth. Because he’s a preemie, he can’t do things simply. He can’t simply recover from a surgical procedure. Instead, his body basically went to war, rallied all of its immuno-responses and inflamed itself into a tizzy. Now that inflammation is preventing his lungs from functioning properly. He has basically been under-oxygenated for 10 days and if he continues down this road, his organs and brain will not be adequately supplied and will likely degrade. So to combat that inflammation, we basically have one last course of action – a really really strong steroid. The doctor described this as “hunting for an antelope with a torpedo.” It is way more drug than he should need to stop the immuno-response but we have to go big or go home because a little won’t do it. As with basically everything in the NICU, this drug, dexamethasone (“dex”), can do almost as much harm as good. In the past, high doses and repeated treatment early on (i.e, w/in the first 7-21 days of life for a preemie) have been shown to double the risk for neurological damage. Also, it increases the risk of pnuemothorax. But we were basically out of options so at about 11pm on Monday evening Anderson started two drips, 1st a paralytic called “Rocs” to paralyze his body and keep him from fighting the ventilator. Everyone expected his saturation to soar when he was paralyzed. Silly guy was fighting the wrong fight and resisted the “fast acting” paralytic for nearly 90 minutes. He kept kicking and breathing heavily and moving around until they finally gave him a bonus dose. After he was well and truly “roxed” as the nurses said, they started the steroid. Although the Rox did not actually increase his saturation, it did have the benefit of making it safe to take him out of his isolette long enough for K to hold him for the first time (!). 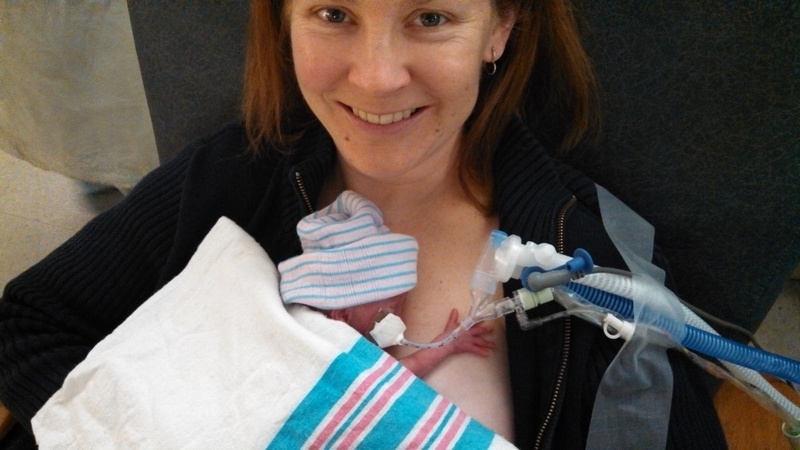 They had almost two hours of blissful skin-to-skin snuggles in a darkened and relatively quiet NICU. We all made it through the night, Ander probably more comfortably than his mommies and this morning after his 2nd shot of steroids (he’ll have 6 doses over 3 days total) and a few cups of coffee (for us!) the world is looking just a bit brighter. Our original doctor is back on today and slowly weaning Anderson off some of his oxygen as he continues to remain stable and comfortable. We know there will be many many many more hills and valleys in this road and that he’s not out of danger. The dex is simply buying him time for his lungs to grow and recover and heal on their own, and the real test will be what happens when the dosage wears off. Of course, another test will be whenever we discover if and what damage the dex caused unrelated to his lung function, but we’ll cross that bridge when we come to it. We can only handle one big challenge at a time! The lows are very low for us so we’re trying to recover and rejoice a bit when he has moment of highs so that we can replenish our reserves. So this evening we’re planning on trying to go home, shower, change, eat a real meal, and cuddle the cats for a bit. We might be in for another overnight bedside vigil, or we might try to catch up on some sleep to prepare for the ones that may be ahead. Time will tell! A watched baby doesn’t oxygenate. We came back to the hospital at 3am after about 5 hours of sleep and a panic inducing wake up call from the NICU. Anderson had desaturated rapidly and they had to remove his ET tube and start CPR. The good news is the CPR worked, the bad news is no one knows why he crashed so hard or so fast and we’ve been trying to play catch up all day. As usual he gives us a glimmer of hope, responding to one treatment idea the first time, and then crushes our dreams when he slowly sinks back down. We cannot fault our doctors for not being inventive, creative, or persistent but at times it seems like they’re throwing the kitchen sink at him and then are unable to figure out which of the new drug, vent settings or head position is the one responsible for his escalation/deescalation. We have both struggled to be positive or hopeful today. Mostly we’re sitting quietly in the corner of his room watching a parade of worried faces pass by the door. It is obvious that everyone in the nursery is pulling for him, even nurses and doctors and lactation consultants and respiratory therapists we’ve never met. It’s like we’re all on Ander’s wild and crazy ride with him, but only he really has the power to steer now. We’re trying to be patient, I just hope he knows where he’s going. Anderson is a Scandinavian name that means brave and strong. Our little fighter fought like hell to give us a very special 27 days together. His story touched hundreds of lives and he was loved by so many. Rest in peace our little boy, you have made us brave and strong mothers and we will never forget you and all that you taught us about our capacity for love. My first time holding my little boy. Your story about dear Anderson made me cry. I am so sorry for your loss. Thank you so much for reading it! It really makes my heart happy to know that others have thought his name during their day :). I live in Norway, and a variation of your son’s name is Anders. May the Grand Creator ease your pain. I’m so sorry for your loss. You and your little boy are amazing. Thank you for sharing your story. I am so glad that you were given 26 days with him. I am sorry for your loss. I am so sorry for your loss. I lost mine to HELLP a year and an half ago. It has been a difficult journey to say the least. I’m so sorry for the loss of your precious son Anderson. What an incredible fighter he was! The picture of you holding him is absolutely amazing and made me tear up. Thank you for sharing his story. I just stumbled on your blog. I am so sorry for the loss of your sweet Anderson. Reading above, it really does seem like he fought the good fight. I’m glad you got some time with him, even though it was far, far too short. My heart hurts for you. Thanks so much for stopping by and reading his story! Thank you so much for sharing your story! My son also lived 27 days and I count each one as a blessing. I pray that I’m as strong as you one day to help others in need! God bless you and your family! I’m so glad you found me but so sorry that you have gone through the same thing with your son. Off to read your little man’s story! I read your letter in Emily Long’s book You Are Not Alone: Love Letters from Loss Mom to Loss Mom. Your letter felt so similar to all that I am feeling after I lost my son on May 26, 2017 – exactly a month after he was born. I had to come and find your blog and just read Ander’s full story. Thank you for sharing and for your beautiful writing. So much of what you wrote, especially describing the rollercoaster ride that is the NICU, spoke to me and related to my experience with my son Thaddeus. Hearing that other loss moms have survived is helping to give me hope that I will too.